Who is reading what on which device has always been a hot topic in digital publishing and today Joe Wikert, the general manager and publisher at O'Reilly Media, shared some details gleaned from O'Reilly's direct sales. This publisher is one of the few that maintains its own ebookstore, and it also regularly polls customers about their reading habits. 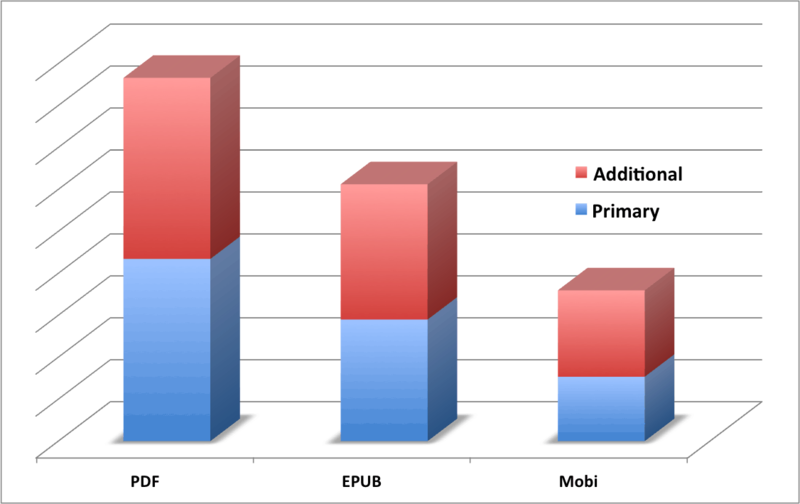 PDF is solidly in the lead as both a primary and secondary ebook format. This does not come as much of a surprise, given the technical content that O'Reilly publishes. PDF has been the preferred format for technical books since long before the Kindle launched and clearly things haven't changed. Coincidentally, the above chart also offers some explanation for why Amazon released their own PDF format, Kindle Print Replica. Clearly there is content that readers prefer to consume as a PDF instead of a reflowable format like Epub or Kindle. 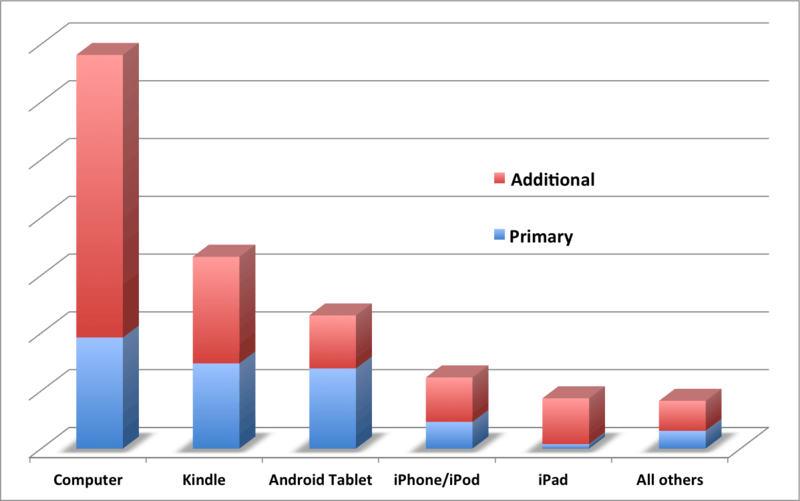 When given a choice, readers prefer to use their computer over any other device, with the Kindle and Android tablets coming in as distant runners up. Note how the iPhones comes in 4th, and the iPad 5th. Those details are especially interesting when you consider how much work Apple has put into trying to turn the iPad into a textbook platform (iBooks 3.0, iBooks Author). When given a choice readers want to use their textbooks on something other than the iPad, so I find it fascinating that Apple has so far refused to (at the very least) release iBooks for OSX. This chart suggests that there would be demand from users. eMusic to Merge with Blio – Wait, what? It seems to me that since the sample set already prefers PDFs, they are almost bound to prefer using a full-sized screen device, i.e., a PC or Mac. Reading a PDF on a smaller screen is painful. It’s not so bad on a 7″ tablet. It’s not clear to me that the 2nd chart really offers much info relative to preferences since there are far more PCs than all of the other devices (except perhaps smartphones.) Also, since they are DRM free it really doesn’t matter which version you have since it’s no problem to use Calibre to create copies in the other formats. I’d think a lot of Kindle users purchase O’Reilly titles from Amazon and not direct from O’Reilly? Maybe. But it’s my impression that a lot of O’Reilly ebooks are sold to buyers who sought out an O’Reilly title over similar titles from other publishers. IMO that type of buyer is more likely to be aware of O’Reilly’s website and buy direct. Seems to me that if you look at the first and second chart together, the mojority of users buy PDFs, but then covert them to be used on a Kindle, which is the preferred portable reading device per the second chart. Yes, PDF’s bound to be popular, given O’Reilly’s audience. As a reader of technical books, I love O’Reilly’s stance on digital books. If you buy the physical version of the book, you can get their digital variants for a $5 fee. Their digital versions can be downloaded usually as an android apk, pdf, epub, or mobi. And the +1 is that they have no drm on them.